Strawberries are another food, like tomatoes, that are amazing fresh and taste like styrofoam when not in season. Both tomatoes and strawberries do not travel well, and do not ripen "on the road". So the best strawberry or tomato is one that is literally right off the vine. Now, most of us don't live with vines growing in our yard (if we are lucky enough to have a yard) so we must either trust the supermarket or find a farmer's market for truly great strawberries. In addition, you want to avoid strawberries that are not organic because they are heavily sprayed and soak up pesticides. 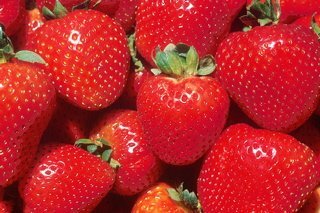 Look for organic strawberries starting in May and ending in August. Look up through the bottom of the package to ensure that none of the strawberries have started to rot. Just rinse, cut up, and serve. Strawberries are a great finger food. Keep in fridge for one week. Yes. 90% of all strawberries sampled by the USDA contained pesticides. How about just serving sliced strawberries with cream? Strawberries are so delicious plain, why do anything to them?